Before refrigeration, adobo mixtures were salt and vinegar blends used to preserve meat. The word adobo comes from the Spanish word adobar, which literally means “to marinate.” Historically it meant a type of pickling sauce made with olives, vinegar or wine and spices. These days, adobo is prepared in two different ways—either a dry spice mix or a wet rub paste. Generally speaking, it’s no longer used to preserve meat, but is mainly a seasoning and sometimes added to beans, stews, and sauces. The basic ingredients in adobo are garlic, oregano, black pepper, and turmeric. Then other spices and/or ingredients are added based on cultural and regional preferences. Cuban adobos usually include garlic and cumin and sour orange juice. Puerto Ricans have a preference for vinegar and oregano. Other ingredients sometimes added to adobo mixes include onions, lemon or lime juice, parsley and/or cilantro. Onions, olive oil, lime juice, sour orange juice or vinegar are added to create wet rubs and marinades. For maximum flavor, the meat is allowed to marinate in the refrigerator overnight. 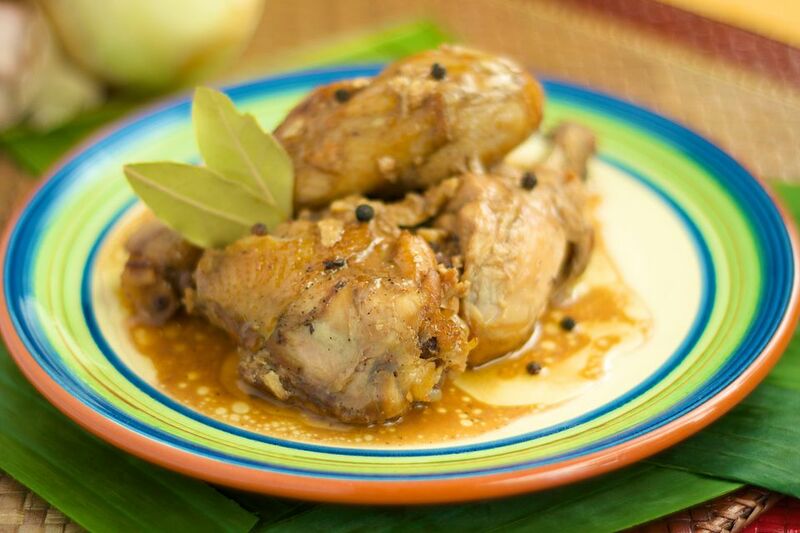 Caribbean Latinos are not likely to cook any beef, chicken, pork, fish, seafood or shellfish without seasoning it first, and adobo is the most common seasoning of choice. It’s an excellent seasoning for most cooking methods such as grilling, roasting, frying or sautéing. Adobo can also be used as a base seasoning for stews, sauces, beans, soup stock, baked potatoes, and vegetables. In Mexico, adobo sauces are red, thick and spicy. Mexican adobos are made with crushed chilies, spices, and vinegar. Pork pieces are marinated in the adobo sauce and then grilled. The adobo sauce can be diluted with water or broth to make a simmering liquid. In the Philippines, a dish of marinated meat or fish seasoned with garlic, soy sauce, vinegar, and spices is referred to as adobo, as in chicken adobo. This name refers to the dish as a whole, not the seasoning of the dish. Commercially prepared adobo pales in comparison to homemade adobo. And convenience really isn’t a factor, as it takes less than five minutes to prepare. This adobo seasoning dry rub recipe (adobo seco) is made with salt, granulated garlic, oregano, black pepper, turmeric, and onion powder. Traditionally, to make an adobo seasoning wet rub (adobo mojado) a mortar and pestle were used to pound and grind the ingredients together. Using a garlic press makes this recipe is a little bit easier. The adobo dry mix seasoning can be sprinkled directly onto the meat or into beans, stews, and rice while the wet rub is used as a marinade.